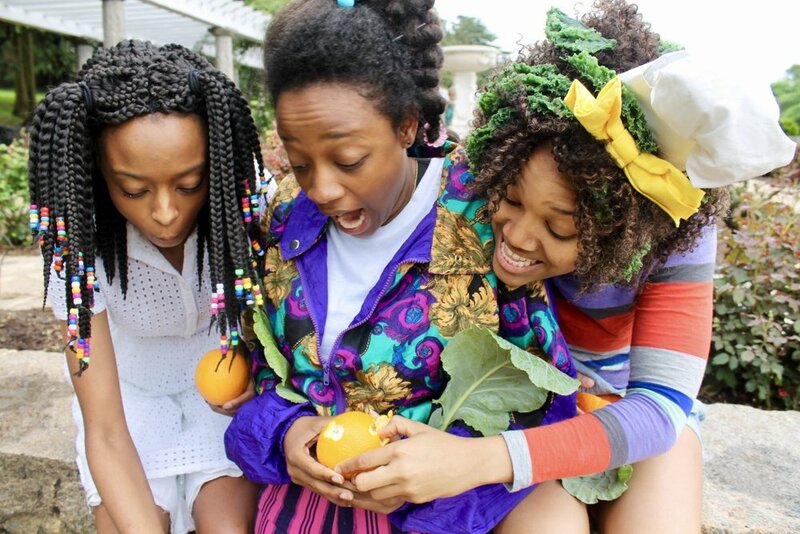 The Tale of Chef Kale is an interactive theatrical experience in a garden, playground, or park near you! This music filled performance centers around the adventures of a fictional 7 year old little girl named Kale. Kale is an aspiring Chef with an afro made partly of the dark leafy green Kale...How did it get there? Join us and experience her story, she'll tell you! Chef Kale and her friends invite children and their families to explore healing, celebration, freedom, self care, identity, and develop a relationship with your food and your digestive system. This immersive show explores the meaning of soul food with curiosity and wonder, offering a holistic perspective to wellness. Action packed with mindful eating tips, nutrition education, and meals created on the spot of fresh organic fruits and vegetables for everyone to taste. * This show can also be presented indoors! To offer an innovative approach to address the affects of a food system in America that is not racially equitable, economically just, and environmentally sustainable. These affects alter the relationship to food, to the body, and to overall health and wellness, which in turn impacts the ability to live freely without dis-ease and disconnect. The Tale of Chef Kale will provide basic information about nutrition and wellness, the importance of a relationship with food, mindful eating, community, self care, and displays the role that imagination, music, movement, and poetic language play in healing and bridging dis-ease and disconnect.